There is a celebratory aspect to Anna Howarth’s work, which refers to the rituals of cultural identity and the joy that it brings. 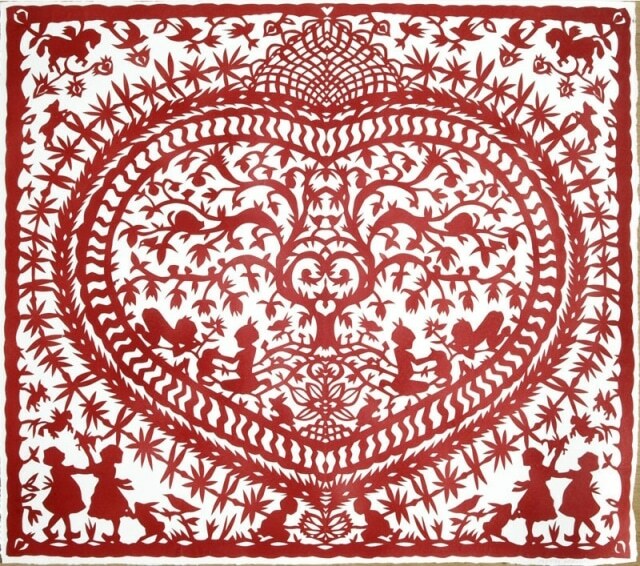 The cyclic pattern of the seasons and the human response to natural phenomena is represented by paper-cutting which in itself is a very basic art form, containing elements of folklore. Anna Howarth’s work explores two contrasting themes, the visible and the invisible: the light and the shadow. The visible is her study of human nature, created from imagination and memories. The invisible explores the unconscious: a thread, which loosely connects her work to Celtic mythology, folklore and fairy tales. Anna Howarth’s drawings stimulate a narrative, which is created by a technique of precision cutting with a sharp blade. Restricting this method to a paper silhouette, contrasting against a light background the work exploits the intrinsic properties of light, shape, narrative and structure and generates many possibilities, thus enabling the viewer to see themselves and the world in new and different ways. Life is like the narratives she assembles. Anna Howarth’s pictures are symbols and stories from the past, present and the future, from dreams and from poems. The primal qualities of a silhouetted world are inhabited by characters from childhood memories, bringing forth powerful experiences shared by all. Such is the universal code, that a narrative is instantly recognised by the cut-out animals and children, who venture across the enchanted paper landscapes, existing somewhere between an innocent reverie and a wished for dream.